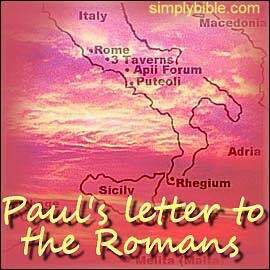 The theme of Paul's letter to the Romans is simple. He expresses it this way... "I am not ashamed of the gospel of Christ, for it is the power of God for salvation to everyone who believes" (Romans 1:16). This lesson is about the meaning, means, and method of that salvation. Paul's remarks about being "predestined" to salvation are more difficult. But at least they clearly imply that God has a predetermined purpose and plan (Romans 8:29-30). This lesson examines God’s plan of salvation under three headings. Salvation is the state of being saved. A child rescued after it has fallen into a swimming pool, or someone pulled back who was about to walk in front of a bus, has experienced salvation. But what is it that we are saved from in the salvation Paul had in mind? The answer is, we are saved from the wrath of God in the day of judgment (Romans 2:5-11). Everyone (including you) has the need of that salvation (Romans 3:23). Some folk wrongly imagine that on judgment day God will put their good deeds in one side of his scales of justice, and their evil deeds on the other side of his scales, and their righteousness will balance their wickedness. But when they are "weighed in the balances" they will be "found wanting" because God will put all their deeds together in one side of his scales. In the other side of his scales God will put his perfect and holy law. All people will fall short of this perfect standard, even if they are guilty of offending God’s law in but one point. They will not stand justified before God (Romans 7:12, 3:19-20). The problem has a solution (Romans 3:23, 7:22-25). We can be justified (and thus saved from God’s wrath) through Jesus Christ. This salvation is possible by virtue of his death in which he shed his blood, his resurrection, ascension, and his intercession for us (Romans 5:6-11, 8:32-34). Isn't that wonderful? We remember that salvation is being forgiven of sins through the sacrifice by Christ of his own body and blood. By that sacrifice we are rescued and preserved from the doom of all sinners. Instead, by the grace of God, we are given eternal life. That is the meaning and means of salvation. The method of salvation is the process we go through in order to have this grace. The chart below shows the method of salvation, including passages from Romans. The chart contains active links to other lessons. —The words of Jesus in the gospels, and Paul’s agreement in Romans, about what people should do to receive grace. Touch any heading to go to a lesson on the subject. ¶“7So then, everyone who hears these words of mine, and does them, will be like a wise man who built his house on the rock.” (Matthew 7:24). ¶“17Faith comes from hearing, and hearing [comes] by the word of Christ [being preached]” (Romans 10:17). ¶“16For God so loved the world, that he gave his one unique Son —so that whoever believes on him should not perish, but instead have eternal life” (John 3:16 ). ¶“16For I am not ashamed of the gospel of Christ, for it is the power of God for salvation to all who believe, to the Jew first and also to the Greek. 17For in the gospel the righteousness of God is revealed from faith to faith, as it is written, 'The righteous shall live by faith. '” (Romans 1:16-17). ¶“31And Jesus answered them, 'Those who are well have no need of a physician, but those who are sick need one. 32I came to call not the righteous but sinners to repentance. '” (Luke 5:31-32). ¶“4Do you take for granted the riches of God’s kindness and forbearance and patience, not knowing that God’s kindness is meant to lead you to repentance? 5But, because of your hard and impenitent heart, you are storing up wrath for yourself when the day of wrath comes, and God’s righteous judgment will be revealed.” (Romans 2:4-5). ¶“32Whoever acknowledges [or confesses] me in the presence of other people, I will also acknowledge in the presence of my Father in heaven” (Matthew 10:32). ¶“8What does scripture say? 'The word is near you, in your mouth and in your heart'. That refers to the very word of faith that we preach: 9 if you confess with your mouth that Jesus is Lord and believe in your heart that God raised him from the dead, you will be saved.10For with your heart you believe to be made righteous, and with your mouth you confess to be saved.” (Romans 10:8-10). ¶“15Jesus then said to his disciples, 'Go into all the world and preach the gospel to all creation. 16Anyone who believes and is immersed shall be saved. Anyone who does not so believe will be condemned'” (Mark 16:15-16). ¶“3Aren't you aware that all of us who were immersed into Christ Jesus were immersed into his death? 4Thus we were buried with him by immersion into death. And consequently, just as Christ was raised from the dead by the glory of the Father, we too are able to walk in newness of life.” (Romans 6:3-4). ¶“61Another said to Jesus, 'I will follow you, Lord —but first let me go back to bid my family goodbye.' 62Jesus said to him, 'No one who puts his hand to the plow and looks back is fit for the kingdom of God. '” (Luke 9:61-62). ¶“11Do not slacken in your zeal. Rather, be fervent in spirit as you serve the Lord. 12Rejoice in hope, be patient in tribulation, be constant in prayer.” (Romans 12:11-12). — A word study of “salvation”. We are saved by grace from wrath through faith. Tap the title above, next to the arrow, to go to that lesson with a link back to this page. —What did Jesus accomplish on the cross? This Bible study answers that question, and explains justification, sanctification, and redemption. Tap the title above, next to the arrow, to go to that lesson with a link back to this page.